A Taliban attack on an Afghan military outpost killed up to 44 policemen and soldiers on Wednesday, while a separate suicide blast in Kabul killed at least 48 people as a relentless wave of violence continued across Afghanistan. Local officials in the northern province of Baghlan said at least nine policemen and 35 soldiers were killed in the attack early on Wednesday, the latest of a series that has killed dozens of members of the security forces nationwide. Later in the day, weeks of relative calm in Kabul were shattered by a suicide attack on an educational centre in a mainly Shia area in the west of the Afghan capital that killed at least 48 people and wounded 67. The attacks, which came as the central city of Ghazni struggles to recover from five days of intense fighting, underlined how hard the insurgents have been pressuring badly stretched local security forces. 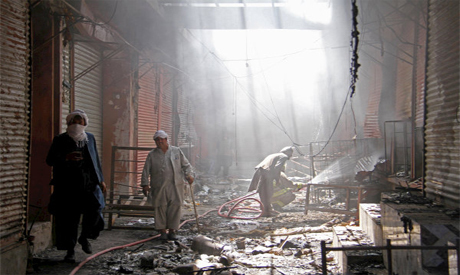 There was no immediate claim of responsibility for the Kabul blast but the attack bore the hallmark of Islamic State group, which has conducted many previous attacks on Shia targets. The Taliban issued a statement denying it was involved. "The extreme human suffering caused by the fighting in Ghazni highlights the urgent need for the war in Afghanistan to end," the top UN official in Afghanistan, Tadamichi Yamamoto, said in a statement. The Taliban, who launched their Ghazni assault last Friday and battled Afghan forces backed by US air strikes in the middle of the city for days, said their fighters were pulled out to prevent further harm to the city's population. "They were facing severe shortages of food and drinking water as the power supply was also suspended two days ago," a Taliban commander, who declined to be identified, said by telephone. The Ghazni attack, one of the Taliban's most devastating in years, has clouded hopes for peace talks that had been prompted by an unprecedented ceasefire during the Eid celebration in June and a meeting last month between Taliban officials and a senior US diplomat. With parliamentary elections due on Oct. 20, the government had been bracing for more attacks in Kabul and other cities, but even so, the scale of the violence has come as a shock to a government facing bitter criticism over its handling of the war. In the southern province of Zabul, Taliban insurgents clashed with soldiers on Tuesday, forcing the government to send reinforcements from neighbouring provinces to retain control of two checkposts.